Time management without timers? That's the draw of Chrometa. Time management without timers? That’s the draw of Chrometa. If you’re anything like me, and chances are that you are, then the end of the day comes all too fast sometimes. Keeping track of where you’ve been and what you’ve done can be more than a pain, it can actually cost you money if you’re one of those who bills by the hour. Whether you’re a freelancer, a lawyer, a consultant or any other field that uses time tracking to bill your customers then using something like Chrometa is a huge relief. Want to see what it does? Take a look. The newest iteration of Chrometa adds a very cool feature indeed. Given that you can use many different devices (not just a PC) to work throughout the day, it’s getting harder to keep track of what you’ve done and for whom. Chrometa’s new cloud integration is hoping to change that difficulty. So whether you’ve been in the office or at your home desk, Chrometa can continue to track and bill your time via its web app. Here’s the catch – Chrometa is in beta right now, and it’s presently only available for the PC. Brett Owens, the CEO of Chrometa, tells us that the Mac version is coming soon but that opens a pretty wide door for those applications that already run on Mac. Still interested? It’s a good thing, because Chrometa is absolutely worthy to be on your radar. That’s good for unlimited users. If it happens to expire though, turn to Twitter. 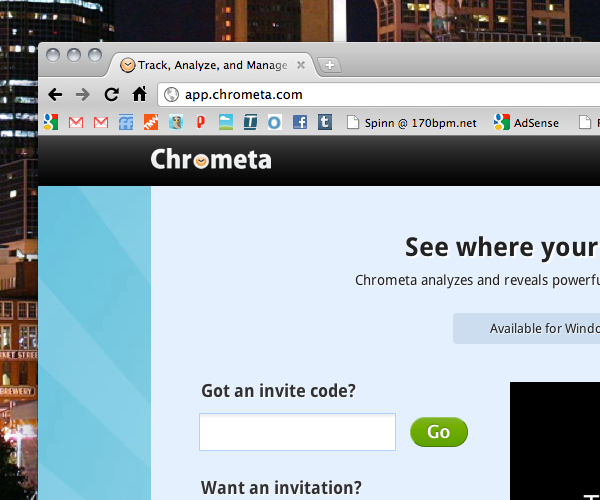 Follow @Chrometa on Twitter and send them a reply stating that you want into the beta. The site promises that you’ll get a direct message with an invitation code within 24 hours. Other choices? You bet. Time tracking is a hugely popular thing and choices abound. Klok, for instance, works across any platform that supports Adobe Air. Manic Time is a slightly-less-pretty option that works on Windows only, but it is free and you can use it now. RescueTime is another option, and probably the closest one to Chrometa. Instead of logging in your time, RescueTime runs in the background and produces reports of what you use. So why try Chrometa? Simply put, we like the reports and we like the depth of them. So far, we’ve seen very few options that provide as much information about how you spend your time and for that alone Chrometa is worth a look.